A few days ago, I showed you how to use a potato stamp to decorate a tote bag. Well I just can’t stop! I’ve started making little cards and prints. I love the way the stamp makes the same shape each time, but it ends ups with a very different iteration each time. The gradients in the ink are particularly beautiful I think. The process to make cards is exactly the same as the tote bag, just with a different surface, so if you want to make these, check out the first tutorial. You can buy this particular set in my online shop, MakeOrBreakShop. I love potato stamps. They are so simple, easy, and inexpensive, yet they produce really cool results. I saw a tutorial on a rhinestone bracelet the other day, but I wanted to try it out with embroidery floss because I have loads of it from my days making friendship bracelets. The floss lends itself to weaving in between the stones and adds a spicy pop of color. This tutorial uses rhinestone crimps which can be tricky to find. 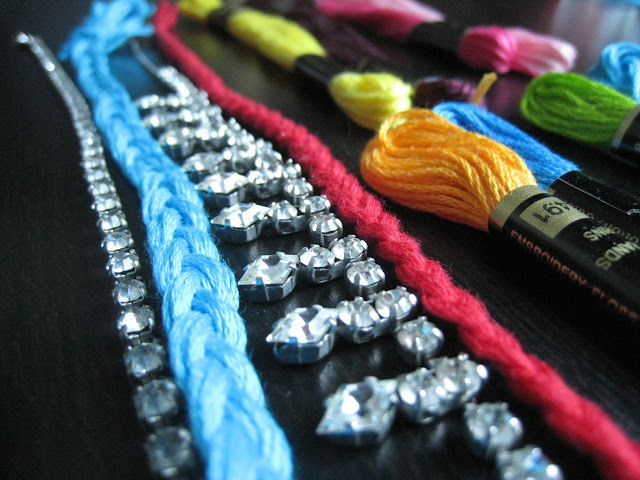 To make a bracelet with only floss and rhinestone chain, check out this tutorial instead. These make great Christmas presents for your besties! Find the supply set in my online shop, MakeOrBreakShop. If you like this bag, you can buy it ready made in my online shop, Make Or Break Shop. I’m working on a tutorial for how to draw a beautiful ocean scene on to a tote bag. Stay tuned! But if you just have to have this one, go get it in my shop, MakeOrBreakShop! What a mess. Why is my tape measure sitting on my jewellery shelf? I used a couple of the push pins to string up necklaces. I also removed anything that didn’t seem like it should really be there… like a tape measure. It’s really so easy to be organized and tidy. Why do we fight it so? I also finally got around to tacking up a couple of my photos and prints on the wall. Starting to really feel like home now! I’m working on a new tutorial involving embroidery floss and rhinestones! Stay tuned!